The Sydney coastline provides some magnificent dive sites, both for shore and boat dives. Virtually all of the coast is able to be dived and you are limited only by your imagination and the means to access the sites. One of the least dived areas of the coast is the section of coast to the north of Botany Bay. The main reason for this was the total absence of any dive charter boats operating in this area. I could never fathom this, as there are some really untouched dive sites out of Botany Bay. However, since the discovery of grey nurse sharks at Maroubra, a number of charter boats are operating on a temporary or permanent basis in this area. Try Frog Dive, Pro Dive or Sydney Dive Academy. However, the best way is to use your own boat as the charter boats do not seem much interested in anything but the sharks. One of these sites is the Pistol Crack. The northern headland of Botany Bay is known as Cape Banks (named after Sir Joseph Banks of course) and is part of Botany Bay National Park. 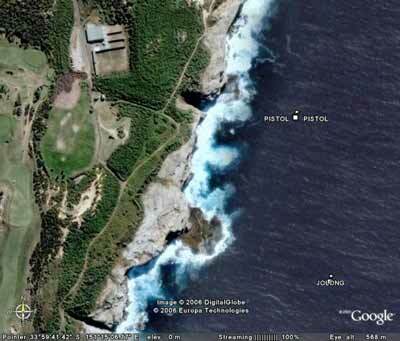 A few hundred metres north of Cape Banks in the national park is the Sydney Pistol Club. This is located on an old rubbish dump and is adjacent to a fissure which was also filled in with rubbish in the 1960s. Run out to GPS reading latitude 33º 59' 44" S and longitude 151º 15' 08" E. Note that all the GPS Readings on my Web Site are taken using AUS66 as the map datum. If you use another datum you may be about 220 metres off the site. See my GPS Page for more details and how to convert readings. From the water, the fissure (or crack) is clearly visible from the water as are the mounds behind the targets. To find this dive site, line up with the crack at a depth of about 15 metres (the crack continues underwater) and run north until the depth comes up to 12 metres. Turn to the east and when the depth drops again to 15 or 20 metres, drop anchor. The anchor should be right on the edge of a three metre wall. To the east is another wall of five metres. Try diving along either of the two walls in a northerly direction before returning back to the anchor area. Head south to the crack itself and then follow it out to deeper water. You can reach 27 metres or so but 23 metres will give you a real good experience. There are some very nice sponges along the sides of the crack, especially in the 22 to 27 metre area. Come back up the crack and in the 18 metre area on the north side of the crack there is an excellent tunnel under a huge rock, a bit like The Whorehouse in Jervis Bay. After examing the swim-through, if you have time and air you can head towards the shallows where you will find the remains of rubbish from the old tip. The fishlife on this dive can be excellent. Huge schools of yellowtail, seapike and nannygais hang over the crack while red morwong line the bottom. At this time of the year, Port Jackson sharks visit the area and can be found near the swim-through. If you have access to a boat, give the Pistol Crack a go.